"The U.S. government has 15 different agencies overseeing food-safety laws, more than 20 separate programs to help the homeless and 80 programs for economic development. These are a few of the findings in a massive study of overlapping and duplicative programs that cost taxpayers billions of dollars each year, according to the Government Accountability Office. [...] The agency found 82 federal programs to improve teacher quality; 80 to help disadvantaged people with transportation; 47 for job training and employment; and 56 to help people understand finances, according to a draft of the report reviewed by The Wall Street Journal. Instances of ineffective and unfocused federal programs can lead to a mishmash of occasionally arbitrary policies and rules, the report said. It recommends merging or consolidating a number of programs to both save money and make the government more efficient. 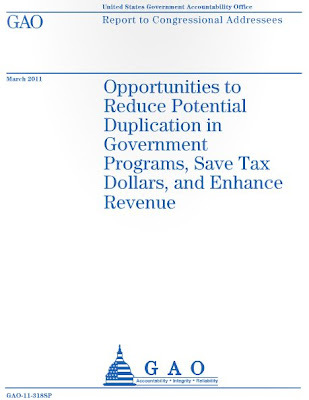 "Reducing or eliminating duplication, overlap, or fragmentation could potentially save billions of tax dollars annually and help agencies provide more efficient and effective services," the report said." Scandalous, gross incompetence, pure wastefulness. Why do people tolerate politicians being so asleep at the wheel?